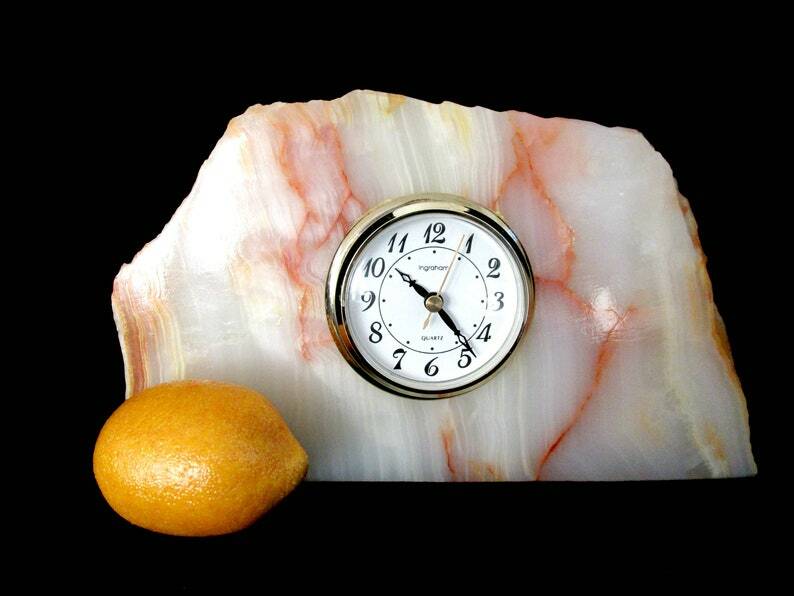 Beautiful old Agate Quartz Slab clock, completed with Ingraham inner workings. Very heavy, large enough for a mantel, very heavy and handsome. The woman I purchased this beauty from said her son made it back in the 1970s. He did very well, the slab he selected is rich with umber or rust colored veining, a masculine looking piece. The inner workings he inserted is made by Ingraham and functions perfectly with a battery. I tested it, and it keeps accurate time. Her son even added extra cushioning within the opening, in addition to the traditional rubber ring that is use by clockmakers. The clock face is clear and in wonderful condition, no cracks. This piece is perfect for a rustic cabin, or just as perfect for a modern decor. You will not be disappointed. Measures 13 inches by 7 inches by 2 inches. Weighs just shy of 10lbs. Please pardon the light reflections.